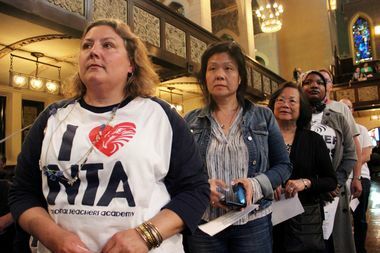 Many parents and staff at National Teachers Academy came out in force in defense of their school, which would be closed and converted to a new South Loop high school under a plan pitched Tuesday by Chicago Public Schools. SOUTH LOOP — A plan by Chicago Public Schools to convert National Teachers Academy to a new South Loop high school drew a simple message from hundreds of neighborhood parents Tuesday: Don't. Hordes of National Teachers Academy parents and staff came out in force Tuesday in support of their grade school at 55 W. Cermak Road, which CPS proposes to close and convert to a new high school amid a development boom in the South Loop. South Loop parents have clamored for years for a new high school in the growing Downtown neighborhood, but National Teachers Academy parents don't want it at the expense of their school, a remnant of the demolished Ickes Homes boosters say is showing new signs of success despite its predominantly low-income student body. Parents say their school is getting cut out of the neighborhood without their voices being heard. Joining the chorus is National Teachers Academy Principal Isaac Castelaz, who said he was never consulted on any plans for the school. 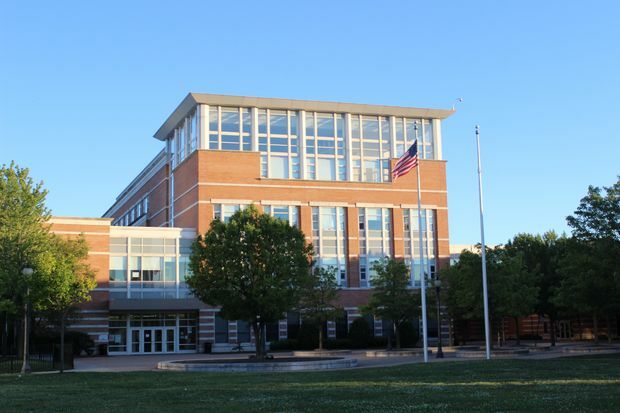 "For this process to be authentic, representatives from (National Teachers Academy) must have a say in the future of our school, along with those who have been at the table for some time developing this plan," Castelaz said Tuesday. "This meeting is a start, but by no means adequate." Tuesday's forum was the first of three CPS plans as it weighs what to do in the South Loop, one of the few neighborhoods in Chicago gaining population and one where developers plan thousands of new homes in the coming years. If realized, the new South Loop high school would also serve parts of Armour Square, Bridgeport, Bronzeville and Chinatown. A new South Loop Elementary School meant to address grade school overcrowding will open in 2019, and CPS already plans to broaden the new school's boundaries, cutting into the National Teacher Academy's territory. Castelaz said CPS didn't make him aware of the boundary decision until it was shared at an unrelated town hall meeting in April hosted by Ald. Pat Dowell (3rd). In two years National Teachers Academy went from the lowest CPS quality ranking to the second-highest mark on CPS' five-point scale. The jump in achievement is a source of pride for parents at a school where about 80 percent of students are raised in low-income households. "Why would you look at this school and say you want to dismantle it?" Hannah El-Amin, a National Teachers Academy parent, said. "This is a school that should be modeled." Converting National Teachers Academy would cost between $5 million and $10 million, a fraction of the $75 million a new high school would cost to build, said Janice Jackson, CPS' chief education officer. "We don’t have the additional dollars to build a brand new high school every time there is a lack of quality seats in an area," Jackson said Tuesday. "It’s our responsibility to look at our portfolio of schools with creativity and sometimes sacrifice to create some balance." But some who attended Tuesday's forum said that $10 million Jackson pitches as a bargain still wouldn't be money well spent. "How far will $10 million go toward investing in new programming for [nearby] high schools such as Phillips and Dunbar?" said Valerie Levan, another academy parent. "If we have this $10 million floating around, we need to put it in the right place, and the right place isn’t retrofitting [National Teachers Academy] into a high school." Not that everyone is against the plan. Some neighborhood parents and students argued that the area's need for a new high school is greater than preserving National Teachers Academy. "I hate that we’re getting pitted against other communities and [National Teachers Academy], you have a beautiful school and it shows in the parents and students who are here today, and keep fighting for that," said Nicole Lee, chairwoman of the local school council at Haines Elementary in Chinatown. "But we are fighting for a high school." Nicholas Lau of Chinatown is set to graduate soon from Whitney Young High School, one of the most prestigious high schools in the state. But Lau said he wishes he didn't have to wake up at 6 a.m. every morning just to hoof it to a school miles from his home. "I would have rather attended a neighborhood high school in the Chinatown-Bridgeport area," he said. South Loop high school students are currently zoned into Wendell Phillips Academy, 244 E. Pershing Road, a Bronzeville school with a massive attendance boundary stretching from Wacker Drive to roughly 67th Street. Phillips enrolls just 533 students according to CPS, but with its entire 2016 class getting accepted into college and a recent state championship in football, Phillips officials say the school's future is bright. Still, Phillips is a hike from either South Loop Elementary or National Teachers Academy. Jones College Prep, a selective-enrollment high school at 700 S. State St. that's one of the city's most prestigious and difficult to get into, is another nearby high school. Just 343 of the roughly 1,800 high school-age teenagers who live on the Near South Side attend Jones, CPS said Tuesday. A converted National Teachers Academy could accommodate about 1,100 students, worrying some critics that the new school would be overcrowded immediately. Jackson said Tuesday she wasn't too concerned. "It definitely serves the need now and will over time," Jackson said. "If we look back and the South Loop is more sought after than it already is … we will go back to the drawing board." City officials are spending more than $60 million, most of it from tax increment financing funds, to build the new South Loop Elementary School after years of overcrowding. South Loop Elementary opened for 580 students in 1988 at 1212 S. Plymouth Court, but now has 767 students, according to CPS. The new South Loop school at 16th and Dearborn will fit 1,200 kids and include 50 classrooms, two computer labs, two art rooms and a rooftop play area, among other amenities. The school will house classes for kindergarten through eighth grade and is expected to open in the second semester of the 2018-19 school year. National Teachers Academy is a neighborhood school managed by the Academy for Urban School Leadership, a nonprofit that manages 30 other CPS schools, including Phillips. The academy is a relatively new school that opened in 2002 and sits on a large lot near two "L" stops on Cermak Road. The city for years has prioritized investing in the area, most visibly in the form of a new Green Line station on Cermak and assisting in the development of a new basketball arena for DePaul University nearby. As its name implies, the National Teachers Academy develops teachers who eventually fan out into the greater Academy for Urban School Leadership network. South Loop Elementary moved its regional gifted center to National Teachers Academy in 2013 as it faced overcrowding. Jackson said she is open to the community's ideas, but CPS has yet to present any other options for a new neighborhood high school. The second of three forums on the school's future will start at 5 p.m. June 20 at South Loop Elementary, 1212 S. Plymouth Court.